Times have been rough in Moon Knight lately... (I think I could sum up just about every modern hero in that very same way) after a brutal battle in an alley with the Bushman two years ago, the Knight crossed the most sacred of lines. At the conclusion of the fight, the Moon Knight was victorious, but his opponent lay dead. In the two years since that fateful evening, Marc Spector has been haunted by visions of a dark-minded spirit, hounding his every step and shouting instructions along the way. It’s made his daily routine into a chore, and kept his guilt over the death of Bushman at the front of his mind. I made no secret about my disdain for this book last month, when I wished the series an early death, but gave it the benefit of a clean slate this time around. And, to be fair, the story’s marginally better than it was last time around. It’s still nothing I’m going to go out of my way to follow, and it often floats directionlessly for page after agonizing page, but there’s at the very least a touch of forward motion present this time around. Mike Benson and Charlie Huston are finally going forward a bit with the registration storyline they’ve been teasing for the last few months, although it doesn’t seem to be a very pressing matter. In his brief appearance, Tony Stark is handled decently enough, and the reasons he’s taking an interest in a C-Level hero like the Moon Knight are laid out pretty well. It’s not like this is a completely worthless story, but the wooden characterization, slow pace, and lengthy, rotten dialog drain it of any and all momentum that the plot happens to build. The opening pages seem to show an improvement in Mark Texeira’s artwork, as the Moon Knight nearly beats a bare-chested bad guy to death with clenched fists, but that quickly spirals downward. 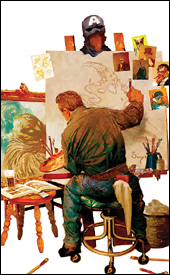 Colorist Dan Brown tries his best to add some life to the page, giving Tex’s illustrations a soft, painterly touch in a few isolated instances, but it’s not enough. These layouts are so dull and boring, lacking in life and personality, I don’t know that there’s anything here worth saving. Nobody looks comfortable (or even familiar) in their own body throughout the issue, everyone (even the supporting cast) is built like Brock Lesnar, and there’s nothing drawing me into these compositions. Tex, man… what happened to you? While this month’s issue is an improvement over the last, I’m still not enjoying what I’m seeing. The storylines in the forefront are excruciatingly boring, none of the characters have an identity, and nothing that happens carries any weight. Mark Texeira’s artwork is about as bad as I’ve ever seen it, too, which doesn’t help matters. It’s not at the bottom of the barrel, but it’s scraping pretty close. Skip it if you aren’t a masochist… it’s still light years away from being something I’d willingly buy on a regular basis.